Pack Your Sense of Humor When You PCS! Every military family has at least one: a PCS story destined to go down in your family history as legend. Stories that may not have necessarily been fun to live through at the time, but that you're able to laugh about now! (After all, sometimes you have to laugh so you won't cry...) Here are a few from MilitaryByOwner’s team that we think you might sympathize with and enjoy. And after you’ve read these, we’d love to hear YOUR funny PCS story! With frequent moves, it’s often difficult to set a decorating style for your abode. But with our move to California, I was excited to deck out the kitchen in retro 1950s diner décor. The inspiration for this decorating idea came from a 50s Formica table with shiny chrome trim that I had recently inherited from my grandparents. Due to a mix-up with delivery timing, our goods were transferred into storage crates and delivered to us at a later date. Our seasoned military friends had cringed when we mentioned the word “storage,” and we soon knew why. When the delivery truck finally arrived, everything that had previously been packed with care had now been crushed together into giant wooden storage crates. Apparently, instead of taking five minutes to unscrew the legs, thus making the table flat to fit in a condensed space, the workers who’d placed our items into the storage crates simply tore the table legs apart from the unit. It must have been like breaking crab legs at Red Lobster. It was painfully obvious what had happened to my table as one of the loose table legs had a triangle-sized piece of Formica hanging off the end of it. I wanted to cry, but my boiling anger prevented my tears! Right before we were due to board a flight to Guam from Florida, our 11-year-old son threw himself into catching a Frisbee at the park (because you have to give it your all, you know) and fractured his hand. I daresay he was actually a little proud of his fingertip-to-elbow cast! Several years later, his brother tried to outdo him by spraining his ankle before we moved to Germany. By then a lanky 6’3,” it proved to be a very painful and unwieldy move for a teenager navigating the terminal and airplane on crutches. With four kids, our moves in country have included my husband and I each driving a vehicle, usually towing something. One leg of a trip found me with two squirmy toddlers, and I ended up passing a giant bag of Skittles to them in the back seat as I navigated toll roads and traffic somewhere in middle America. One blessed hour of silence later, we rolled into the rest stop and my husband was surprised to greet two rainbow-colored but happy little ones. Sometimes a big bag of candy is the ticket! While my husband was deployed to Afghanistan, I packed out, shipped our vehicles, and dealt with the myriad paperwork alone in Germany. After several days of packing out and loading, I exhaustedly stood in the doorway watching the last moving truck trundle down the street. In a "you can't make this stuff up" moment, the phone rang and on the other end was my husband…telling me that his orders had completely changed and he was being assigned to a different base. For one wild moment, I envisioned myself running after the truck and waving them down. Not that it would have helped, but it seemed reasonable for a moment! The whole scenario ended up with me at the transportation management office, POA and paperwork in hand and a little overwhelmed, desperately (and kindly, I hope!) asking for help. And it all worked out. The military takes care of its own! PCSing in the days before there were as many “pet-friendly” hotels had its challenges. My husband and I were caught sneaking our massive Rottweiler into our hotel room when we thought nobody was looking. As hotel management lectured us, our big Rottie stepped up to the man, sat on his foot, then leaned against him, pressing his head up for a pet. Management told us to sleep well; he hadn’t seen a thing. 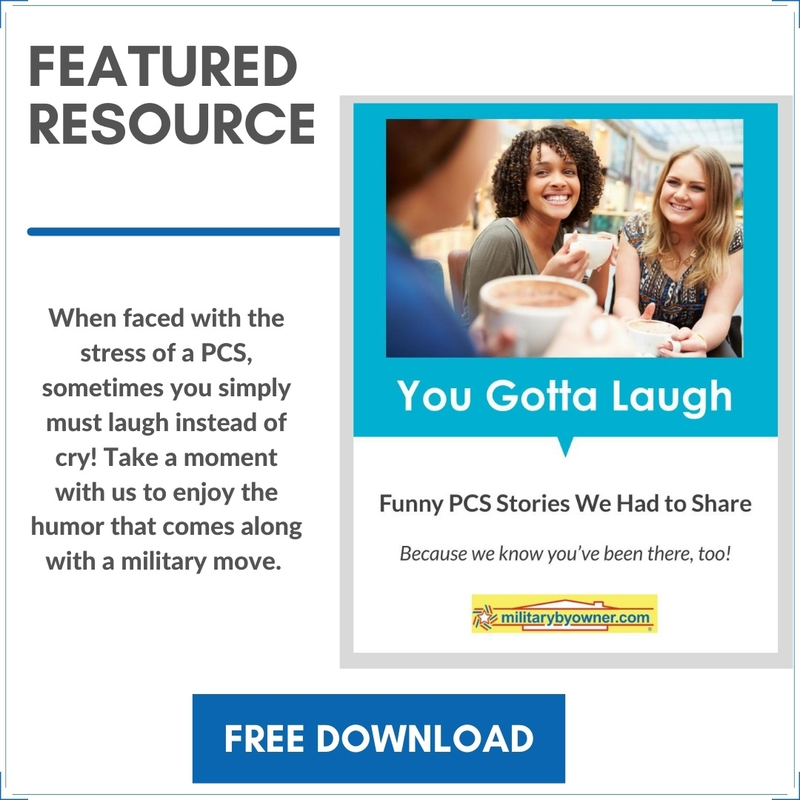 For more military move stories that will give you a chuckle, download this FREE e-book in our series of PCS e-books, You Gotta Laugh: Funny PCS Stories!